South Adelaide have pushed themselves back into the SANFL Macca's League top five after grinding out a 20-point win over Adelaide on Saturday afternoon. It certainly was not one for the purists, but the Panthers adapted best to the swirling conditions at Hickinbotham Oval and lifted themselves to a 9.6 (60) to 6.4 (40) win thanks to a string of late goals. In a dour arm wrestle more befitting a mid-July fixture, the the lead never pushed past 15 points for either side through the first three quarters. Crows man mountain Paul Hunter closed the gap for the visitors to eight points midway through the final term, before South kicked three in as many minutes to put the result beyond doubt. The Panthers were powered by a brilliant performance from Abe Davis. The former Swans rookie continued to grow in his utility role and was outstanding with 27 touches (14 contested), eight marks, eight tackles and a goal, while also pinch hitting in the ruck at times and winning six clearances. Equally impressive through the middle of the ground was the tandem of Joel Cross and Keegan Brooksby at the stoppages. Cross led all comers with 28 disposals (19 of those contested), while the undersized Brooksby battled manfully against the imposing figures of Hunter and Reilly O'Brien at the coalface while also making his presence known around the ground. Both sides took some time to get going, as they felt each other and the breeze out. South worked hard to push themselves into the lead through tough set shots from Tom Fields and Sam Overall. However, Adelaide eventually wrestled back the ascending and kicked the last three goals of the term to take a five-point lead into the first break. The second quarter proved to be an equally dour arm wrestle. It took 20 minutes for the zippy Connor Fairlie to punch home the first goal of the quarter after a silky leading pass from Joel Cross and once Abe Davis snagged his first three minutes latter all the scoring for the term was done. With scoring proving hard to generate, South's backline stood up exceptionally well to nullify each dangerous forward venture the Crows could muster. Former skipper Brad Crabb was a welcome return after one game in the Reserves and missing Round 2 due to personal reasons. The veteran was instrumental in shaping South's back six and limiting the impact of their dangerous AFL-listed forwards. Ladies Day is back in 2018 - grab your tickets here! As the breeze eased away in the third the play began to open up. However, scoring continued to prove elusive. Fields (21 touches and two goals) banged home his second after a nice chain of play and showed he is relishing his move higher up the ground. Adelaide pulled one back as Michael McMahon capitalised on a defensive error, before Overall regained South's two-goal buffer with a tough set shot after catching his man holding the ball. South finally put the game away in the fourth, as Nick Liddle, Fairlie and Matt Rankine put through three goals in quick succession. Hunter pulled one back late in the contest, but it would prove too little, too late as the Panthers put the punctuation mark on an important win. While not playing champagne football, it was a positive response to the effort given at the Parade a week earlier. 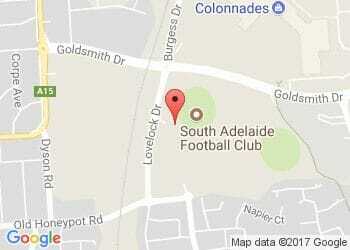 South now enjoy a 10-day break before taking on West Adelaide at City Mazda Stadium on ANZAC Day eve.